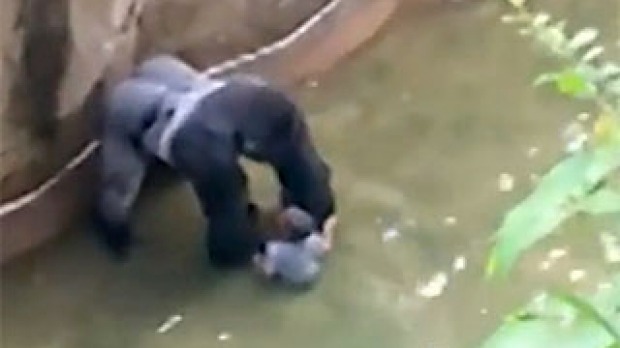 Do Parents in Gorilla Case Have Legal Grounds to Sue? The parents of the 3-year-old boy who fell into the Cincinnati Zoo’s gorilla enclosure more than a week ago could sue the zoo. “The trouble with barriers is that whatever the barrier some people can get past it. … No, the zoo is not negligent,” Maynard said. And last week, the Cincinnati Zoo erected new barriers around the gorilla enclosure. The exhibit was opened on Tuesday. “The fact that the zoo has improved the enclosure to make is safer IS NOT admissible evidence in a case against the zoo for the purpose of showing that the condition of the enclosure was inadequate before the changes [and] improvements,” Quinlan said in response to questions about the new barrier. And despite the boy not being seriously injured in the fall or by the gorilla dragging him around, the family could cite emotional distress. “Had the boy been seriously injured, his claim would likely have a higher value given that fact. Nonetheless, the boy and his parents will have claims for their emotional distress,” Quinlan added. A few other lawyers have weighed in on the case, including Fox News judicial analyst Judge Andrew Napolitano. He said that a lawsuit against the zoo could arise, with the parents arguing that the design of the gorilla enclosure wasn’t well done. However, he doubted that such a lawsuit would make sense, as the child wasn’t injured. “Would the parents sue the zoo because the zoo failed to protect their child from their own negligence? A tough case, but it could happen,” he said. The parents of the boy said they are not going to sue the zoo. In a previous statement, they asked well-wishers not to send them financial gifts, but instead, they should make donations to the zoo. The mother of the boy was not charged with any crime, according to Hamilton County Prosecutor Joseph Deters on Monday. “By all accounts, this mother did not act in any way where she presented this child to some harm,” he said, adding that “she had three other kids with her and turned her back. … And if anyone doesn’t believe a 3-year-old can scamper off very quickly, they’ve never had kids,” CNN reported.